The 118th Art Discussion Group Meeting will be held on Tuesday 25th February 2014 at 19.30hrs at MISCO OFFICE (first floor) in Fino Building in Notabile Road, Mriehel. ADG is inviting the painter Noel Attard to meet its members and friends in relation to his exhibition: Arti Nattard inaugurated on Friday 14th February 2014 at Cavalieri Art Hotel, St. Julians. The artist will answer questions from the floor regarding his vision, concept, and career. ‘Arti Nattardo – A Hedonistic Approach’ is a fairly large and representative exhibition of his work (about 39) that demonstrate his love of texture and pastel colours. Our members and friends have an opportunity to view through professional images shown on screen the whole collection. A hedonistic, pleasure-seeking approach to life, a love for life and a passion for life quite characteristic and distinct marks the essence of Noel Attard’s fantasy world and surreal concoctions. He is a romantic dreamer and poet who seeks lyrical symphony, an artist of feeling and sensual titillation, of frenzied passion and overflowing emotions. He transforms reality as seen through the physical eye with the mind’s eye into surreal scenes of elegant and sensual beauty full of fantasy and imagination. Quite eclectic he is inspired by nature and metamorphoses the physical and tactile world into spiritual beauty or as an aesthete into its joyful essence. He is a mannerist that reduces graphic linearity and melting, palpitating shapes into soft and ghostly pastel shades and earth colours. 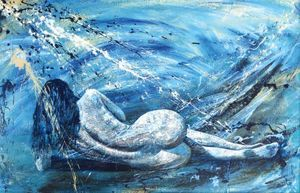 His subject is an excuse as his main aim is to transform the canvas into tactile and subtle textures for emotional enjoyment. His concept of art is to stimulate joy and pleasure through musical balance, poetic feeling and lyrical sensuality. Noel Attard (b.1966) was brought up in an artistic milieu that nourished him. He exploited such background to the full coaxing his determination towards an artistic career. After attending art schools, Noel sought to compliment his applied practical and technical experience with theoretical academic studies at the University of Malta where he graduated in History of Art in 2006. Since his initial participation in 1998 in a collective exhibition in Bath, England through the co-ordination of the Malta Society of Arts, Manufactures and Commerce, he has never relented and has participated in a considerable number of collective exhibitions both in Malta and foreign countries to the present. 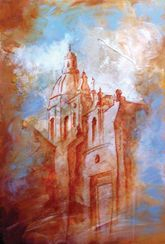 In 2003 he held his first personal exhibition at St. James Cavalier, Valletta, followed by his recent show at the Loggia, National Fine Arts Museum, Valletta in 1990. Noel aims for the essential or the essence in his art and conveys only what he thinks is vital to grasp or to capture the viewer’s attention. The texture is the result of a rich impasto or scumbling technique (dry brush technique) a balance reached between the aggressive application of paint and use of surgical gauze glued to the ground that thickens and roughens the canvas and a studied use of subtle colour and soft tonal effects. Noel’s art is a paean to life, a musical symphony that generally shows the emotional state of the artist in depicting a particular piece of work. His works form an essential part of his lifestyle and are thus an integral part of his life. He is an incurable romantic with deep sentiment and passionate emotions and feeling. His fantasy and imagination lend human warmth to an expressive language. Noel is grateful to his family for becoming what he is today.